There is no missing the church at Filkins as it stands alongside the main road through the village. However, interestingly enough, they are one parish now but it was not always so as the two places are separated by the Broadwell Brook, and Filkins, originally part of the parish of Broadwell, never had its own church until the nineteenth century. Visually one community, at Filkins and Broughton Poggs it is not obvious where one village finishes and the other begins! It was built to the designs of George Edmund Street in 1855-7. Plans had been drawn up earlier in 1851 by the local squire but Street, the diocesan architect, was asked to comment on them, and comment he did aplenty ! He said he disliked the fact that there was no architect's name on the plans, the roof was too wide and poorly supported, there were no gutters, the vestry had a flat roof and the openings for the proposed bell were too small. The spaces between the pews were too little and he felt the people would be unable to kneel. For the same money such a wide church could be replaced by a nave and aisle. Street therefore had to produce a plan of quality if he was to avoid the same sort of examination and comparison to the original plans! He did. 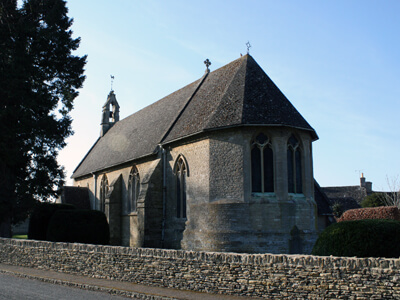 St Peters consists of a nave with west bellcote, small south porch, north aisle and an apsidal chancel with north vestry. Both the exterior from the east and the interior view to the altar show the unusual grouping of the three apse windows, close together rather than evenly spaced as was more usual. The ceiling of the chancel is decorated with stars. The view to the west end is more typical of churches of the time, and nothing special although the good proportions and roofs are to be seen. Please see the monthly Parish Pump for service times and up to date news from your Church. Harry MacInnes. email harrymacinnes@yahoo.co.uk. Tel: 01993 845954. Trish Poole. email church@2stpeters.co.uk. Tel: 07976 055308. Karen Todner. email karen@karentodner.co.uk. Tel: 07587 107277.